Looking for a quiet romantic evening at home this Valentine's day? Our Date Night gift box is the perfect gift for couples who like enjoy each others company at home. 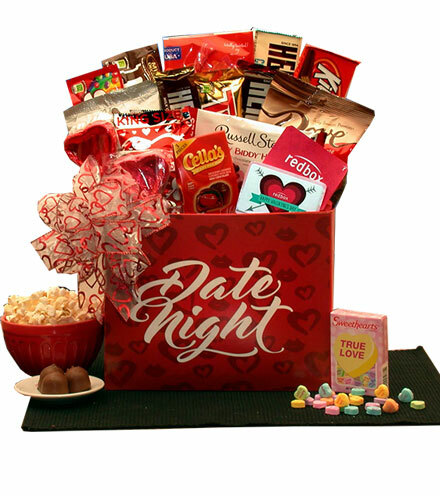 We've included a $10.00 Redbox gift card to rent all the romance movies your heart desires, chocolate treates, and scrumptius sweets all ready for a romantic night together. Includes: Date Night Gift Box, $10.00 Redbox Gift Card, Cella's chocolate covered cherries, Dove milk chocolates, Hershey Kisses, Chocolate lip pop, Hershey classic milk chocolate bar, Hershey cookies & cream bar, Hershey milk chocolate bar with almonds, Twix milk chocolate & caramel bar, Kit Kat bar, Twizzlers, original skittles, Plain milk chocolate m & M's, Russel Stover's Iddy Biddy chocolate hearts, Russell Stover's Caramel filled milk chocolate heart, Sweet Hearts True Love Conversation Hearts. This gift is wrapped in cellophane and topped with a handmade bow.